The Alehouse series puts emphasis on the details to create a totally unique flooring experience. A multi-layer, hand-staining process has been used to create an inner glow effect that darkens towards the timeworn plank edges. Due to the natural glow, the Alehouse series has high color variation. Meaning, the color hues will span a range from low to high for added brilliance​. Vintage, long-length planks measure up to seven-feet long for a more coalescent floor. Our exclusive vintage surface treatment finish adds even more character for the look of a reclaimed, custom hardwood floor. Reflective of the Blue Ridge Mountains and warm autumn toned leaves, our Blue Ridge Collection offers a subtle design statement. Hand selected, character grade hardwoods featuring four distinct color visuals with a unique mix of naturally occurring knots and mineral streaks. The British Isles series offers the look and feel of a timeworn, natural, oil finished floor but with the ease of maintenance of a traditional urethane finished floor. Wide width, long lengths, and inclusions of knots and mineral streaks all add to the beauty of this floor. With a mix of classic and trend setting colors, British Isles blends well with all decors. Our craftsmen have delicately scraped and hand honed this floor to resemble the look of Old English Pubs where friends, family, and travelers gathered to relax and converse in a warm and inviting atmosphere. The long 7 foot planks give the look of times gone by. We used a character grade maple to bring out the natural beauty of the wood grain, along with filled splits and knots for more of that old world look. Designed with the spirit of the American frontier in mind, the Frontier series represents the culture and beauty of the mid-west. Choose from hand carved wood planks in color tones that are reminiscent of westward expansion farms and ranches. The entire series is made from birch hardwood due to durability, flexibility, and the attractive grain pattern. The hand crafted Roma series takes its name from the historic empire whose legendary stories were filled with romance and adventure. Rich and bold colors perfectly compliment the hand stained hickory's striking grain pattern. 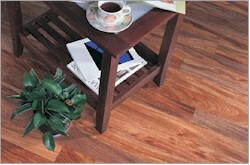 Multi-width boards are included in every box of material to create an impressive floor pattern. Johnson Premium Hardwood Flooring continues to be one of the leading companies in exotic hardwood flooring industry. Since our inception in 1999, we have continued to bring in a variety of wood species from around the world. This allows us to offer a comprehensive collection of flooring products that will match any home and lifestyle. Moreover, we craft each species by defining their unique graining, dramatic characteristic and beautiful coloration. Our products are recognized for their affordability and superior quality. We offer the most worry free floors in the industry. Each plank is precision milled and prefinished by using the most advanced manufacturing technology available in the industry. Johnson hardwood floors are manufactured with the greatest care and backed by a warranty that assures a lifetime of satisfaction. By combining our dedication to excellence accompanied with the most advanced manufacturing technology, Johnson has become one of the most preferred brands with today’s homeowners, builders and designers.